The recycling of obsolete and discarded materials is nearly as old as humankind itself. While the Recycling Today Media Group (RTMG) does not go back quite that far, our commitment to the recycling industry dates back to 1963 when Recycling Today was founded as Secondary Raw Materials magazine. Since that time, we have been publishing an increasingly comprehensive trade magazine and have branched out to become much more than just one magazine. The RTMG is committed to meeting the needs of its readers by providing the most relevant and current business information to effectively manage their companies and meeting the needs of industry suppliers (our advertising customers) by ensuring they receive maximum exposure to the thriving recycling industry. And thriving the recycling market is. Today’s industry, driven by strong demand, is a truly global phenomenon. Consumers of recovered iron and steel, metals, paper, plastics and other materials ship their materials from one side of the world to the other. Recyclers of materials such as concrete, wood and mixed construction and demolition (C&D) debris operate more regionally, but learn best practices from around the world. Companies that manage information and the consumer product supply chain until end of life must all meet global standards whether operating in a regional or a worldwide market. This global marketplace means that industry managers must stay abreast of the latest market information and industry trends. That’s the reason our media products have grown to include print magazines, e-newsletters, websites, video hosting sites, directories and guides, deep industry databases and conferences. 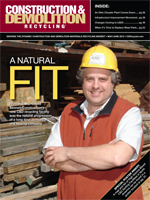 Recycling Today (RT), the flagship magazine of the RTMG, produced monthly provides broad coverage of the recycling industry and offers a depth of market and commodity information along with news, industry developments and company profiles of recyclers. With a weekly e-newsletter, specialty newsletters targeting the fastest growing segments of the industry and a website that is constantly updated with information, news and tools, RT has a depth of coverage that taps into decades of experience while also recognizing the continual evolution of the industry. Construction & Demolition Recycling (C&DR) magazine, along with its website and e-newsletter products, offers independent coverage of the recycling of C&D materials, from demolition work and the processing of the material it generates to the processing of mixed debris and land-clearing material. It also includes the business of brownfield redevelopment and meeting LEED green building requirements. Recycling Today Global (RTG), a website and twice-monthly e-newsletter, offers the comprehensive coverage the RTMG is known for in North America to a wider global audience. RTG helps recyclers and their suppliers from throughout the world stay attuned to changes in scrap flows and processing techniques around the world. 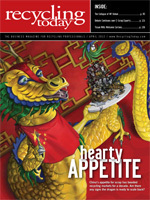 Waste Today (WT), a print magazine complemented by a weekly e-newsletter and website, covers collection and transfer, organics, recycling, conversion technologies, waste to energy, landfill management, special and hazardous waste, markets and contracting, mergers and acquisitions and more—all aspects of the solid waste industry in North America. Recycling Today — This weekly e-newsletter delivers the latest in news from across the recycling industry, from metals to municipal programs. It also includes information on products and technology for the industry. Recycling Today Global — This twice monthly e-newsletter serves the global recycling industry, delivering news and product innovations. Recycling Today Auto Shredding News — This monthly e-newsletter recaps headlines in the automotive recycling and shredding sectors. It also features products and services targeted to these segments of the industry. Electronics Recycling Report — This monthly e-newsletter targets the electronics recycling and ITAD (information technology asset disposition) industries. Whether you specialize in refurbishment and resale or shredding and material recovery, this e-newsletter has something for you. Plastics Recycling Report — Our monthly e-newsletter that covers the plastics recycling industry, including generation and recovery trends, processing technology updates and consuming industry activity. Mexico and Latin America Business Monitor — This monthly product presents news, commodity market insights, company profiles, equipment and technology information and legislative and regulatory updates tailored to processors located in this region of the world. It provides unique access for organizations marketing to the region and sourcing materials from Mexico and Latin America. Construction & Demolition Recycling — This e-newsletter is delivered to subscribers' inboxes twice per month and covers news and developments in the construction and demolition recycling sectors as well as new product innovations. Waste Today — This weekly e-newsletter bring readers the latest news and developments in the solid waste industry.